Laurie Piccone & Jenna Ernst traveled to the Orlando Beauty Show to meet and exchange ideas with fashion experts Nick Arrojo & Angus Mitchell son of Paul Mitchell during a recent Orlando Beauty Show. Laurie Piccone & Nick Arrojo at the 2009 Orlando Beauty Show. 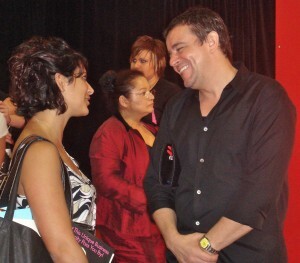 Laurie Piccone at 2009 Orlando Beauty Show with Angus Mitchell.